Rosa Hilda Ramos and the Communities United Against Contamination (CUCCo) have been working hard since 1991 on the conservation and preservation of the Las Cucharillas Marsh. This marsh is located in the San Juan Bay Estuary and it’s the only tropical estuary under the United States National Estuary Program and holds one of the largest wetlands ecosystem in the region. Though it is one of the last open spaces in the area, industrial work had been contaminating the air and water ever since the beginning of productivity. 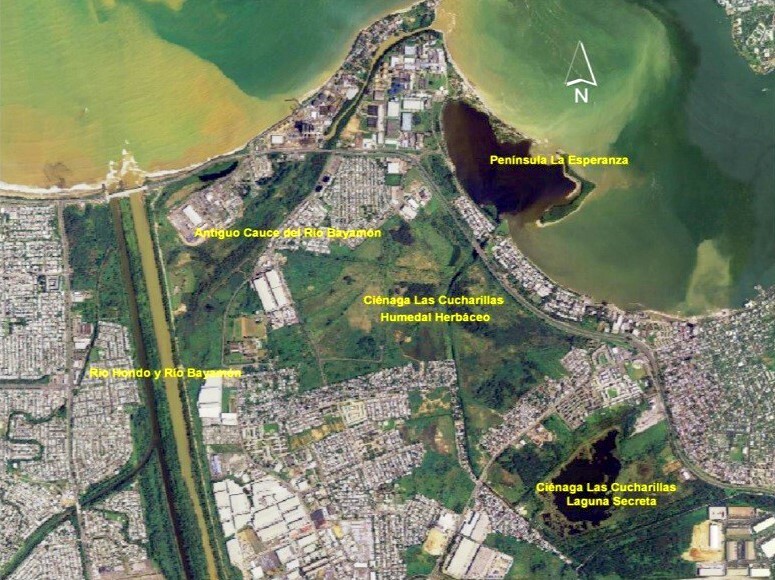 The Environmental Protection Agency (EPA) gathered some results of an investigation made by themselves which showed that industries in Cataño, near the Las Cucharillas Marsh, were responsible of the air pollution that had been affecting local neighbors. Because of this, the town was suffering from the highest rate of cancer incidence and respiratory diseases in Puerto Rico. EPA shared their results with the Government of Puerto Rico but no entity had taken actions to address the problem. In 1991 Rosa Hilda Ramos, the CUCCo, and other community leaders brought their complaints to the Department of Health of Puerto Rico and the State Environmental Quality Board demanding action of the EPA. As a result, the EPA held a public hearing to inform their results and address the matter. It was clear for the investigators that the one responsible for the majority of the incidents was the Puerto Rico Electrical Power Authority (PREPA). PREPA was found in violation of the Clean Air and Clean Water Acts by the EPA, so it was fined US$10,000 by the Puerto Rican Environmental Quality Board. Court decision was a victory for the community but by 1993 the industries around the area had failed to reduce their toxic emissions. Ramos and the CUCCo were not satisfied with the addressing of the problem so far so they sued PREPA in federal court because of their negligence. PREPA was found responsible of the respiratory and health incidents in Cataño. The fine was for US$7 million to pay to the federal government. Ramos and the CUCCo proposed the idea to take part of the $7 million fine to buy the almost 500ha that forms the marsh. In 1999, they convinced the EPA to redirect US$3.4 million, of the US$7 million fine, to purchase the 1,200 acres of marshland to ensure its protection. The money wasn’t enough to purchase the entire marsh so since 2001 Ramos and the CUCCo have been working on solutions to buy the rest of the lands for its protection and conservation. In the late 2004, Las Cucharillas Marsh was declared a protected area. Later that year, the Bacardi Corporation, which has the largest distillery in the world with operation base in Cataño, transferred 10 acres of land (worth $1 million) to this reserve. The transfer was part of the settlement between Bacardi Corporation and the EPA over the company’s violations to the Clean Water Act. Wal-Mart Stores, Inc., provided US$100,000 for the preservation of Las Cucharillas due to an agreement with the EPA. Thanks to this actions, by the end of 2007, the CUCCo and Ramos had acquired and ensured 300 acres of these wetlands for its permanent protection. Ever since, the CUCCo and Ramos had gained many followers and supporters and had joined forces with the Corredor Del Yagüazo, Inc. to expand their knowledge and give a better protection of the ecosystems. The project is still on-going since Ramos and the CUCCo won’t stop until the 1200 acres of land had been purchased and its protection and conservation is ensured. Project Details 1,200 acres of wetlands. Highest rate of respiratory diseases and cancer incidence in Puerto Rico (80's and 90's). Why? Explain briefly. Court's decision and CUCCo have helped on the preservation of this marsh that holds the habitat of an extensive variety of flora and fauna. Now people in Cataño have a cleaner air. "In the shadow of polluting factories in Cataño, Rosa Hilda Ramos led the movement to permanently protect the Las Cucharillas Marsh, one of the last open spaces in the area and one of the largest wetlands ecosystems in the region." Brief explanation of who is Rosa Hilda Ramos and what she did with the CUCCo.